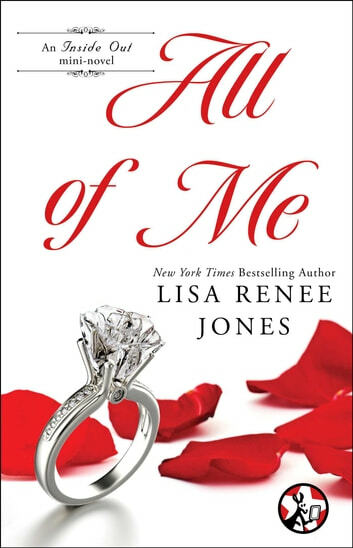 I was gifted a copy of All of Me for an honest review. Lisa Renee Jones did an excellent job with this final installment of the Inside Out series. It contained just the right amount of intrigue and romance. It also tied of loose ends from the previous books within the series. The reason I gave it four stars instead of five is because I now have to go back and catch up with the rest of the series. This was the last book in the series and to me it didn't really add anything that we already knew from the other books. Overall this series was really good, a lot of the books i couldn't put down. There are a few characters in this series that i see get there own series like, Ella and the walker brothers. I look forward to reading their stories. I never give spoilers ... so you won't get one now! I have followed Chris and Sara through all the books in this series...which I discovered about a year ago! This story sums up their journey of love, lust, trust, truth, and more! in this story we celebrate life and love ... and it's an emotional ride ... one you'll enjoy. In this story we get another glimpse of Mark and Crystal as well ... If you haven't been following their story, I think you REALLY need too! I was in happy tears ... I love a good love story (and wedding) I loved the details which made the story come alive! I could practically smell the roses! Lisa Renee Jones writes pure magic! I love these characters. I loved this story. This book w as a great ending!!! I will miss them so much!